Books that simultaneously address family history and religious studies appeal to both of my literary obsessions, and hence tend to be among my favorite reading material. Several years ago Prophet’s Daughter by Erin Prophet told the story of the rise and fall of the Church Universal and Triumphant in a way no one else ever could; the author being the ultimate insider yet also a complete outsider. An insider in that she was a participant in all the events she describes, but an outsider in that she entirely rejects the belief system constructed by her parents. The finest book in the literature about Edgar Cayce, in my opinion, is Sidney Kirkpatrick’s biography Edgar Cayce: An American Prophet, because it goes into greater depth about the extended family of Edgar and Gertrude, their parents, siblings, children,and cousins, than any before or since. It is not unusual for the descendants of a movement founder to find themselves at odds with the authorities who gain control of a religion’s governance. The entire family of Elizabeth Clare Prophet is now in such a position, but far more extensive are the descendants of Joseph Smith, Jr. Although the Utah Mormon church accounts for about 98% of LDS membership worldwide, most of the prophet’s descendants ended up in the Reorganized LDS church, which in 2001 became the Community of Christ. It is far more theologically liberal than the Utah church, for example having ordained women since the 1980s. According to certain traditions, the family of Jesus found themselves alienated from the authorities of the early Christian church. Although the Gospels name four brothers of Jesus and mention unnamed sisters, by the fourth century church authorities decided that he could not possibly have any siblings because Mary was a perpetual virgin, and this remains official church doctrine among Roman Catholics, Eastern Orthodox, and some Protestant groups. Although earlier historical records indicate that people had been recognized as blood relatives of Jesus in the first century, they were ultimately defined out of existence because they conflicted with a dogma based on metaphysics rather than history. But no case of a split between a prophet’s family and the religious authority structure of a faith community is as extreme and antagonistic as the example of the Baha’is. Eric Stetson has brought to light what he aptly entitles A Lost History of the Baha’i Faith, predominantly the unpublished writings of Shua Ullah Behai, grandson of the Baha’I founder Baha’u’llah. 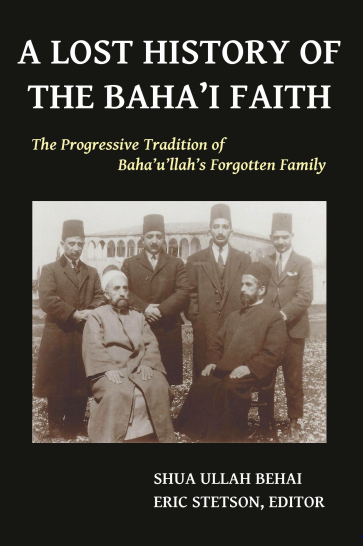 The collection includes the works of a dozen other individuals, almost all descendants of Baha’u’llah who have been not just alienated from, but demonized by the religious authorities who govern the contemporary Baha’i community. The highest current authority is the Universal House of Justice, an all-male governing body that was first elected in 1963, six years after the death of the only Guardian of the Faith, Shoghi Effendi. The office of Guardian was ordained by the Will and Testament of Abdu’l Baha, oldest son of Baha’u’llah and grandfather of Shoghi Effendi, to last in perpetuity. But the Guardian was supposed to be a lineal descendant of Baha’u’llah, appointed by his predecessor; and Shoghi Effendi died without leaving a will and after excommunicating all his relatives, including his parents and siblings. Hence the Guardianship was declared abrogated. In this context as with the previous generation of leadership, excommunication is combined with shunning, and those shunned are called “covenant-breakers” and described as having a contagious spiritual disease. There are now several competing sects based on various claims by non-descendants to inherit the mantle of the Guardianship, but none of these have been supported by any of the Baha’I descendants. The new book now available is the work of an earlier category of “covenant-breakers,” those excommunicated by Abdu’l Baha, including two of his brothers and all their families—one of whom, a nephew, is the primary author of the book. Stetson’s excellent introduction and conclusion are scholarly rather than polemical in tone, but the notes and comments in the body of the book show his admiration and sympathy for these excommunicated relatives. The surviving descendants who cooperated with Stetson and encouraged publication of the book have a positive message of inclusion and reconciliation. But like the great-great-great-nephews and nieces of Jesus, their very existence is an “inconvenient truth” to the belief system as it evolved under ecclesiastical authority over time. The forthcoming volume of correspondence of Thomas Moore Johnson reveals a hitherto unsuspected connection between early American Baha’is and the HBofL. The phrase “Religion of the Stars” appeared as a catch-phrase of the astro-Masonic late 19th century group the Oriental Order othe Magi. The OOM, as it turns out, involved both Ibrahim Kheiralla, the first Baha’I missionary in the US, and some correspondents of Mr. Johnson. Mr. Kheiralla, who died in 1929, is one of the many “covenant-breaker” dissidents whose writings are included in A Lost History of the Baha’i Faith.